Today we are going to tell you about a patient with some unusual heartworm test results. 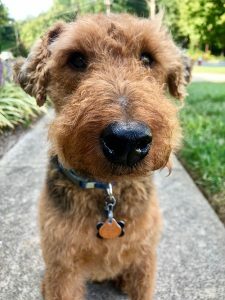 Meet Dalton, an almost 13-year-old Welsh Terrier. Back in 2017, Dalton was surrendered to a rescue group. At that time he had a severe flea infestation, he was mildly anemic, he had hookworms, and he was positive for heartworms. Dalton was treated for the fleas and the intestinal parasites. He was also treated for the heartworm infection. The heartworm treatment protocol included injections of melarsomine, the product that is used to kill the adult heartworms. These injections are given over a period of time: one injection is administered at first, and then a month later two more injections are given 24 hours apart. Dalton was also started on monthly heartworm prevention. Dalton’s last melarsomine injection was in November of 2017. 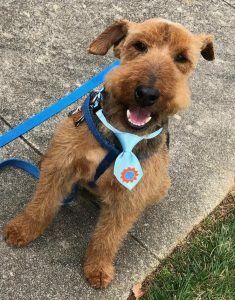 In March of 2018, after Dalton had been adopted by his new owner, Dalton tested negative for heartworms at a different clinic. Dalton first came to Lawndale Veterinary Hospital in June of 2018, where he met Dr. McGlothlin. He was doing great at home and the owners were consistently giving his monthly heartworm prevention. At the end of January 2019, Dalton’s owners brought him in for his annual heartworm test. They had still been giving his heartworm prevention regularly every month. The in-clinic heartworm antigen test was positive. Dr. McGlothlin decided to submit a second heartworm test to the lab to confirm the positive in-clinic result. That test also came back positive. So what could have caused Dalton to show up positive in January 2019 after being treated for heartworms and then testing negative in March of 2018? One theoretical explanation certainly could be that he simply became reinfected with heartworms after the negative test in March of 2018. However, Dalton’s owners were absolutely certain that he never missed any of his monthly heartworm prevention doses, so that option was ruled out. There are actually some other reasons why Dalton’s March 2018 heartworm test may have show up ‘negative’ when in fact it should have still read ‘positive’. Since heartworm antigen tests detect antigen produced by the female heartworm, male-only heartworm infections will likely not be detected by these tests. If there is a low number of adult female heartworms present, the test may not detect the antigen either. In a prepatent infection (which means the heartworms are still immature), the antigen will not yet be circulating at detectable levels. It takes between 5 and 7 months after a dog has become infected with heartworms for an antigen test to show up positive. Immune complexes can form and bind up the antigen, making it undetectable by the heartworm test. In this situation, the dog’s immune response basically causes the heartworm antigens to be trapped by the host’s antibodies. When the antigens are bound up in these complexes, the SNAP test may not find enough detectable antigen levels to call the test positive. Any laboratory test has the possibility of being erroneous at times. For Dalton, we will not know for sure if one of the above explanations caused the unexpected test results. Another possibility that we will discuss in a future blog involves the idea of heartworm resistance. There is evidence that some strains of heartworms are becoming resistant to some heartworm preventions. Stay tuned next week to learn more about heartworm resistance. Would you like to read more about heartworm disease in both dogs and cats? Then visit our ‘Paws to Protect: Heartworm Disease‘ page on our website. You can also visit the American Heartworm Society’s website for a large amount of in-depth information about heartworm infection and prevention. Lawndale Veterinary Hospital recommends year-round heartworm prevention for all dogs and cats. Give us a call today if you have questions or need more heartworm prevention for your pet! American Heartworm Society Pet Owner Resources. Dryden, M. Canine Heartworm Antigen Tests. Kansas State Veterinary Diagnostic Laboratory Diagnostic Insights. January 2017. Stilwell, N. Blocked Antigen Causes False-Negative Heartworm Test Results. American Veterinarian. June 4, 2018.